Monika September 23, 2016 September 23, 2016 No Comments on Are you connected to me on LinkedIn? Find your dot! It not only provides you with many connected dots, but also with some metrics. What for, you may ask. Well, first it’s just fun to see your connections flying around you as colored dots. Second, visualizations help people to understand complex things and may inspire them. Visualizing your network can lead to the discovery of (unexpected) connections, clusters, and holes. This again may just be a fun insight. Or, more rationally, may make you think about how to enlarge, diversify, and strengthen your network. Because your network is your main source for learning, inspiration, and development. Following other peoples thoughts, opinions, insights, and developments lets you constantly learn new things, get new perspectives on old things, and grow. In order to let this happen, your network has to be diverse. You don’t learn too much from the fellows you shared your whole professional pathway with. Who inspires you are those people at the edge of your network, those who share some but not all of your interests. So how to find these people? One way is rational: Analyze your social network, find “loose dots”, expand from there. Actively search for connections in areas you’re not connected with already. Ask people to introduce you to their network. But then there is also serendipity. Serendipity has helped me discover a world that I would have never known before. The foreign places-foreign in the sense I have never been there–are where I have the greatest leaps in understanding and grasping of the potential. I cannot imagine not knowing what I have learned in serendipitous encounters. 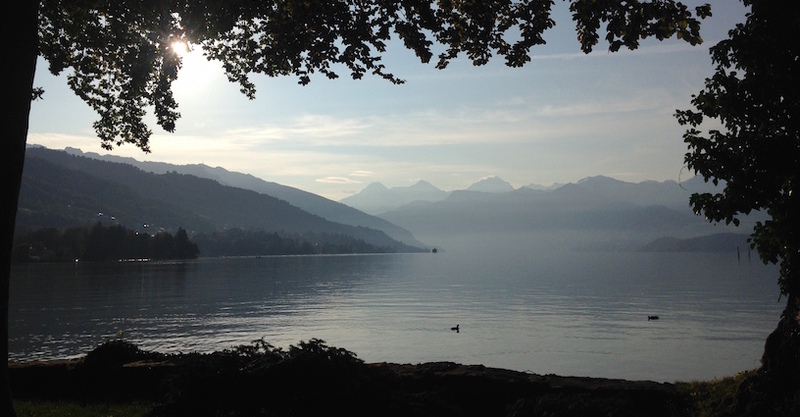 writes Anne Adrian about her experiences with blogging and online engagement. Serendipity, that’s the fortunate encounter happening by chance. That’s reading an article, following a link in it, following a second link, and suddenly bumping into something new and wonderful. Serendipity just happens, it cannot be planned or aligned with goals. But by being open-minded in a well-connected time, and by allowing time spent with “just browsing around” or “just talking and connecting to people for no reason”, chances for serendipity to happen rise. Don’t miss this opportunity! But back to you, my dots. What did I learn from the analysis of my LinkedIn network? 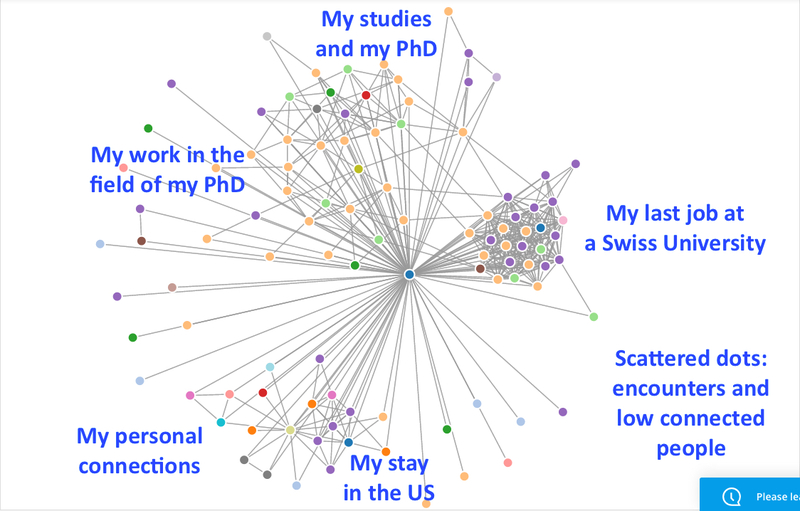 Not very surprisingly, I am well connected to Academia (purple dots) and the health care industry/ the medical sector (yellow dots), and those people are also well connected among each other. Interestingly, some people I do know from those fields stay very low connected on LinkedIn (some of the scattered dots), so the network may strengthen by introducing them to each other. Still, it is not the most diverse knot in my network- many people share education and/or professional milestones with each other. But then those are the peers who know, understand, and support you. The most colorful spot is at the bottom: people I know from my private life, and people I met during a stay abroad. They do have immense diverse background and therefore are valuable inputs for further learning and development. Keep an eye on them! But clearly there is one very weak area: The area I am just entering, the field of Knowledge Management. So although I strongly believe in serendipity and its great value, I learned from my analysis that I should start to also rationally connect to people who can help and support me to enter this new field and to connect me to more peers and mentors in KM. Curios about your network? Check it out at Socilab!